Archives and Special Collections + University Weekend Activity Map . . . In the spirit and long established tradition of celebrating homecoming at Setonia (more commonly known as Seton Hall University Weekend), the Archives & Special Collections Center is partnering with organizers of this event to commemorate milestone events in school history for those in attendance. With this in mind, here is an overview of various historical-inspired highlights that will connect our place with students, parents, alumni, and other special visitors who will be in South Orange to personally enjoy the sights, sounds, and commemorative aspects of campus from Friday, September 23rd-Sunday, September 25th in particular . . . 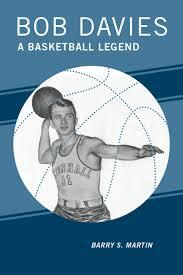 Along with hearing his talk, Mr. Martin will have copies of the book – Bob Davies: A Basketball Legend, (Rochester, NY: RIT Press, 2016) available for purchase and reading at the event courtesy of the University Bookstore. In addition, a special exhibit on the Setonia connections to Davies has been created in conjunction and cooperation with the Walsh Library Gallery. A window box display (located in Walsh Library facing the Recreation Center) featuring various artifacts and items from the University Archives Collection have been assembled in honor of this talk and launch of the book. This exhibit will be up through the entire month of September into October. Prior to this talk, parents visiting campus are invited to join a historical tour of the University Grounds as part of a program entitled: “Campus Then and Now” which will take place on Friday, September 23rd from 2:00-3:00 p.m. starting in the Rotunda of Walsh Library. This fun and informative stroll around campus will involve a historical overview of the school and detailed descriptions of campus architecture and significance of physical plant development over the years. For more information on the tour and to register please consult the Seton Hall Weekend website . Alumni and Student Life in particular are also being celebrated that weekend, and in recognition of the times and legacy of the Golden Pirates of 1966, a display case exhibit showing various items representing the anniversary of this class and their activities at Setonia can be found on the First Floor of Walsh Library (opposite the stairwell) near the entrance to the Archives & Special Collections Center. Featured is collage of various illustrations showcasing special programs, snapshots, athletic information, student activities, and even the annual Galleon and “April Fool’s Edition” of The Setonian for that year. This case will be available for view throughout University Weekend. More information on the full schedule and overview of programming to take place on University Weekend and to register for different events please visit their main site. For more information on the talks, displays, and other questions involving school traditions please feel free to contact University Archivist, Alan Delozier via e-mail at: Alan.Delozier@shu.edu or by phone: (973) 275-2378 for more information. Enjoy the event and activities ahead!